Medications, Treatments & Herbicides | Mann Lake Ltd.
Keeping your bees healthy is a key to a successful season. We have solutions for the maladies that can affect your bees - from varroa mites and foulbrood to hive beetles and nosema. Varrao mites are an external parasitic mite that can only reproduce in a honey bee colony. Varroa feed and reproduce on larvae and pupae in the developing brood, causing malformation and weakening of honey bees as well as transmitting numerous viruses. Click here to see varroa mites on bees. Appropriate treatments: Hopguard II, Apivar®, Mite Away Quick Strips™. American foulbrood (AFB) is a bacterial disease that affects the larvae and typically proves fatal for a hive. Click here to see AFB. Appropriate treatment: Terra-Patties®, Terra-Pro, Oxytetracycline. 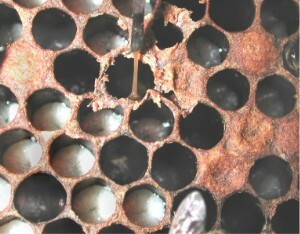 The small hive beetle can be a destructive pest of honey bee colonies, causing damage to comb, stored honey and pollen. If a beetle infestation is sufficiently heavy, they may cause bees to abandon their hive. Click here to see a small hive beetle. Appropriate treatments: Beetle Blaster traps, Gardstar® or Permethrin SFR (ground drench). Wax moths don't attack bees directly, but feed on their honeycomb. Their full development to adults requires access to used brood comb or brood cell cleanings—these contain protein essential for the larval development, in the form of brood cocoons. The destruction of the comb will spill or contaminate stored honey and may kill bee larvae. Click here to see wax moth damage. Appropriate treatment: Para-Moth®.